Issued at 11:34 am EDT on Monday 2 November 2009. Given the complexity of the situation today, the estimates give good guidance. south should turn northerly later this afternoon ahead of the change. Mt Baw Baw AWS is currently offline. during Wednesday, passing to the south of Victoria late Thursday. change extending from the west, reaching central areas at night. Thanks Wes for your bday wishes. That is a great report Karl, batteries locked and loaded. 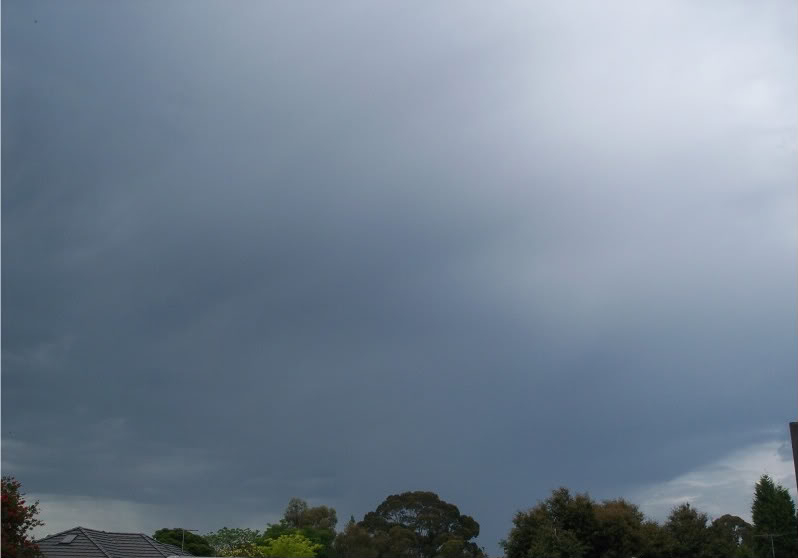 Looking S with the first line of precip that dropped 50c sized raindrops. 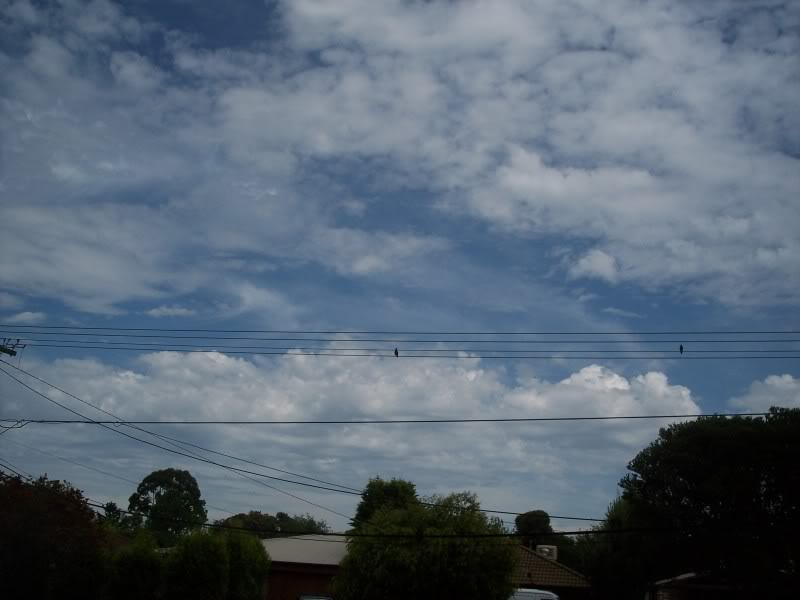 Looking west twenty minutes ago suggests heating is not a problem and plenty of convection to work with. Apologies for the power lines but couldn't bothered walking down the street or climbing!! Cloud cover has barely changed here in the last 2 hours. Starting to warm up very slowly now a little bit of sun is comming through, but not a huge amount. Currently 22.4 in bayswater. Not sure how much the clear air will help heating in this region. Hi Karl, sent you few sms's since 9am this morning not sure if you got them or not but just letting you know. Got a report from Anthony Violi of moderate convection to the NW over the central ranges. Could anyone in the region specify what is happening out there? Storms will come from that location this afternoon. I cant see anything here Karl, but there is still alot of high cloud here atm. Cant see too much through that anyway. Don't worry mate, the best will after 6pm anyway but some middle level storms could develop over the coming 3hrs. Greg Sorenson wrote: Thanks Wes for your bday wishes. That is a great report Karl, batteries locked and loaded. Thanks John. Got a message from Brayden. He's up in Castlemaine without internet but will give updates if anything is developing in the avo. Along with Rikki, the nw central ranges are covered;) Also have a photo buddy down along the great ocean road until tomorrow morning, so should get updates from him as well. Interesting that UKMet has got the trough wind change coming through as a SSW change so to me that could mean it won't be going as fast as suggested as there is a steep kink in the trough and better storm development. Its got the Northerlies covergeging with the SSW wind change West of Geelong at around 10pm... Then few hours later winds go back to the West again. Latest GFS has some good local rainfall near Geelong now of 25mm wouldnt suprise me to see these local falls in parts of Melbourne to tonight I'm definetly not discounting it. Valid from midnight tonight until midnight on Tuesday, 3 November 2009. Trough will continue through the eastern half of the State overnight and during Tuesday morning, clearing the State by mid day. Thunderstorms will remain a risk overnight and Tuesday morning on and ahead of the trough with storms clearing the far east ranges by early afternoon. Thunderstorms should clear the Melbourne area by 1-2am and contract to the far east by 6am. Greg Sorenson wrote: Thanks John. Got a message from Brayden. He's up in Castlemaine without internet but will give updates if anything is developing in the avo. Along with Rikki, the nw central ranges are covered;) Also have a photo buddy down along the great ocean road until tomorrow morning, so should get updates from him as well. 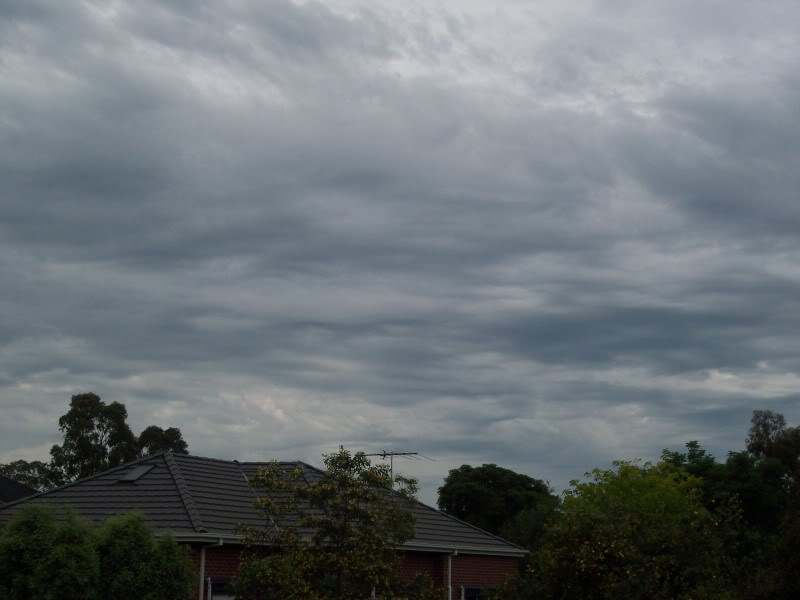 Well i have to say, with the temperatures really struggling here, and the figures on storm cast, i am fairly unconvinced of anything happening in the metro and easter suburbs of melbourne. Looks as tho there may be some interest for the north central and n/e central areas but only after midnight. The west may get some short lived action up until about 7 tonight but hey, i am just guessing in all honesty. Karl your enthusiasm and optimism is an shining light as always. but im just not feeling it today. Again and again it has been repeated that Stormcast is really a light guide...Friday night just gone it had nothing for us at the time the line of severe storms moved through... so if your basing no action on that then it is a weak and flawed outcome. My enthusiasm is on what the sky is naturally indicating, and that is dynamic instability, high precipitable water values, I mean 24/17 here currently. I don't know what else to say - I cannot convince you but I am certainly feeling and expecting a good night. Oh its not just storm cast, i know how off it can be. Things just dont seem quite as how i'd like them to be for a good night in my area granted i am stuck in my office so cant observe with my eyes as much as id like, so im restricted to getting info from the AWS, and things like that. Karl Lijnders wrote: Again and again it has been repeated that Stormcast is really a light guide...Friday night just gone it had nothing for us at the time the line of severe storms moved through... so if your basing no action on that then it is a weak and flawed outcome. I agree Karl. After Friday and Saturday as well, it is safe to say there is a lot of moisture around this season...possible max around 10-11pm pre-change at 29 degrees possible even. If this happens there will be fireworks galore. Expect to see some action in the next few hours, will be all mid level and fairly short lived, if you look at the AccAs they are showing great instability..sounding is good, plenty to work with. But the action starts tonight.. i really like the orientation of the rain in SA atm, brings melbourne into play with storms rolling off the ranges tonight ahead of the change, and then a finale on the change itself. Again some areas will miss out totally but thats the nature with these situations..
AmaroK wrote: Oh its not just storm cast, i know how off it can be. Things just dont seem quite as how i'd like them to be for a good night in my area granted i am stuck in my office so cant observe with my eyes as much as id like, so im restricted to getting info from the AWS, and things like that. Things will change dramatically weather-wise late this afternoon, early evening, when those hot northlies come in, hopefully the temp pumps up with humdiity remaining high. It really is going to be a late maximum. I was expecting to wake up to a little bit of warmth. Well, I'm with Karl and Anthony. I think tonight should be at least half-decent if anything. You really can't write off anything so early. Seeing as there's a lot of support and even the BoM thunderstorm forecast looks good. Trough will be late so plenty of chance for action. Saturday night took a long time to get going but you always thought something would develop and it did. Should be fun. Lets just say I feel more confident about today than I did about Saturday. I think it is safe to say we are in for some action, but like AV says, we could see some areas getting dumped and slaughtered and others getting not much. It is safe to say that you won't see anything like below!!! 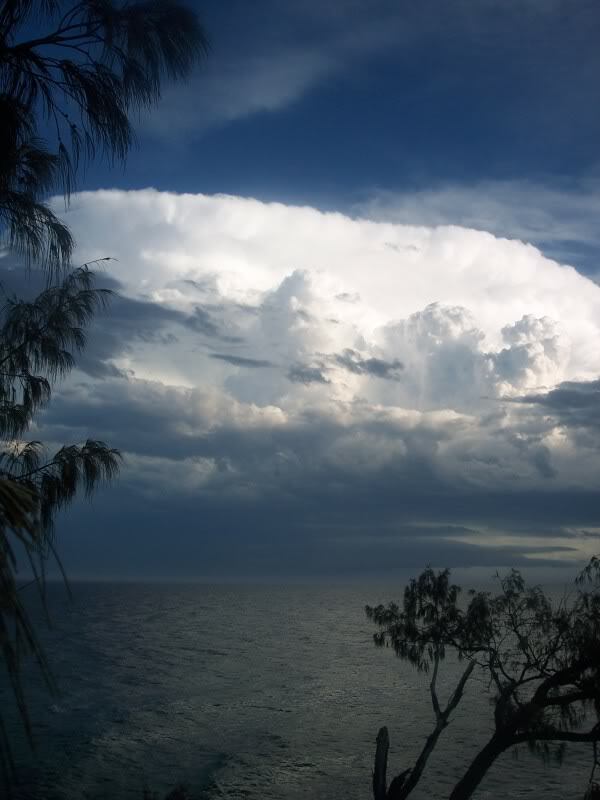 This was taken earlier this year in QLD off Noosa, similar airmass to that day but much stronger trigger. We are about a month away from seeing supportive troughs like this one. Sky clearing down here, a stiff s/w keeping the humidity down, but 1 k from the coast its a bit steamy. One side of the bay has s/w and the other s/e winds. The west of the state has easterlies and the east has westerlies, its all over the joint. ATM id say 10% chance for me but might be a diff ball game around 7-8pm.